In the days following the decimation of the Iraqi Army during Operation Desert Storm, groups of Iraqi minorities, specifically the Shia in the south and the Kurds in the north, seized on the weakness of Saddam Hussein’s armed forces to try and overthrow the Iraqi Baathist regime that had oppressed them for decades. At the behest of President George H. W. Bush, protesters and Iraqi Army deserters began to take over major cities such as Basra and Kirkuk; they believed that with anticipated American aid they could overthrow Saddam Hussein and end his tyrannical regime. 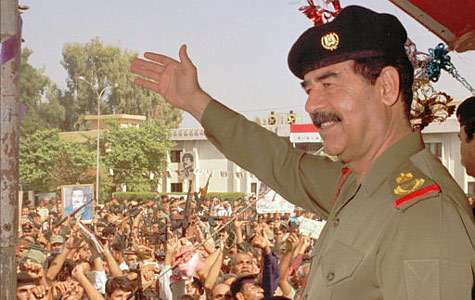 In the end, hundreds of thousands of protesters and rebels were killed when Saddam’s forces regained control of the north and south, and the United States missed an opportunity to remove his regime from power a decade before President Bush’s son, George W. Bush, made the costly decision to send American forces back into Iraq to overthrow Saddam. Scholars continue to debate whether a better plan to end of the war — perhaps a plan modeled after the ceasefires Henry Kissinger negotiated between Israel and Syria and Israel and Egypt to end the October 1973 Yom Kippur War — might have prevented the Shia and Kurdish deaths in Iraq. Thomas Pickering spearheaded the United States’ efforts of resolving the First Gulf War conflict diplomatically as the U.S. 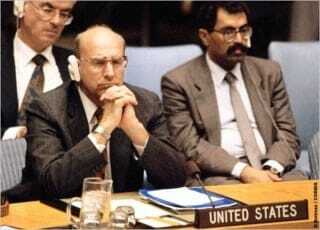 Ambassador to the United Nations from 1989-1992. He worked for Secretary Kissinger during the period of shuttle diplomacy that ended the Yom Kippur War. He was interviewed by Charles Stuart Kennedy beginning in April 2003. Chas Freeman served as Ambassador to Saudi Arabia throughout the Persian Gulf War. 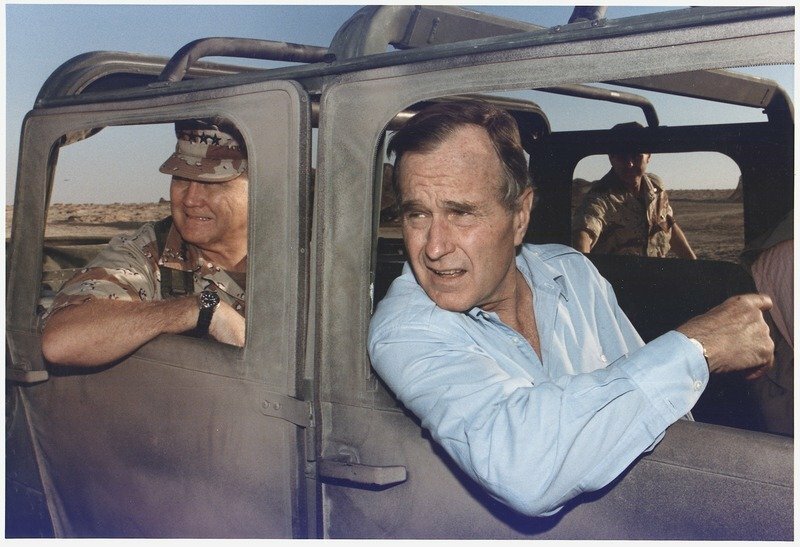 During his time there he experienced great frustration with the lack of direction given by Washington in regards to American objectives in Operation Desert Storm and later at the slow speed at which consideration or aid was given to the rebels in Iraq. Joseph Wilson IV served as Deputy Chief of Mission in Iraq from 1988-1991, and as Acting Ambassador from 1990-1991. David Mack was Deputy Assistant Secretary of the Near Eastern Affairs Bureau. Kenneth Stammerman served as Consul General in Dhahran, Saudi Arabia. They were all interviewed by Charles Stuart Kennedy. 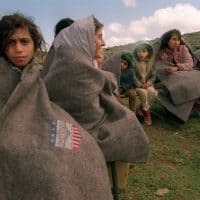 Read about Kurdish refugees who sought asylum from the U.S. in Iran in the 1970s and about the files on Saddam’s persecution of the Kurds. Go here for other Moments on the Middle East. So we did and we quickly evolved at his suggestion — why not borrow Henry Kissinger’s model from the first Sinai disengagement, on which I had worked. The model we developed was fairly simple: that the end result of a negotiation over Iraqi withdrawal from Kuwait had to involve a few elements on our side. Those elements would be that Iraq would remove itself essentially from all the desert (low population) territory along the Saudi-Kuwaiti border back to the areas of population or 200 miles, whichever was less, into Iraq. 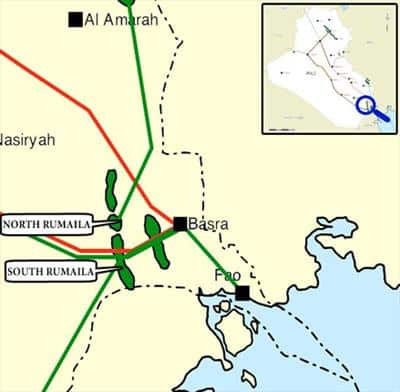 So it meant that in effect we would create a UN zone in southern Iraq that would be occupied by UN forces as a peacekeeping mission that would cover all of that desert area including the northern portion of the Rumaila oil fields and right up to the outskirts of Basra and to the major towns along the Euphrates as it went through that desert up to 200 miles inside Iraq. Beyond that we would create additional zones of disarmament, the first being that there would be no tanks, artillery or anti-aircraft weapons for another hundred kilometers or so. These were zones of limited armament. Each zone would be limited in equipment. The nearest to the outside would have the greatest limitations beginning with tanks and artillery, then anti-aircraft weapons and so on. We favored a no-fly zone over all of Iraq including rotary wing aircraft. So it was a forward move effort rather than to say what is it we will give up from Kuwait. It was a step further to protect Kuwait and to say “Iraq, you accept now the responsibilities for this.” This was put together, we sent it to Washington, Washington said they liked it, they thought it was the right way to proceed. I wanted a starting point. I didn’t think we were going to end up here necessarily…. All of that stuff was folded in and some of this anticipated what came in Resolution 687. But the most interesting thing was that at the end of this second phase (of negotiations at the UN), just as we were about to terminate the war, we re-submitted this whole proposal and said this should be our approach to war termination. We pushed it hard. Secretary Baker via (Under Secretary of State for Political Affairs) Bob Kimmitt said he pushed it. It was killed by the military, I think principally by General [Norman] Schwarzkopf in part because he didn’t understand it and two he thought it was going to involve a big effort on the part of the United States military to have to impose this and or to man it. In the meantime, I talked informally with the British and the French. They were all for it certainly at the UN, but I’m sure they discussed it in capitals and they thought in fact that the ground forces could come exclusively from outside the U.S., but that the U.S. would have to provide the air forces to patrol this. And, in fact, of course as you know, we provided both ground forces and air forces throughout that whole period of time. So the objection was that what we ended up having to do anyway we would have had to have done. The difficulty was that we lost the opportunity to be in direct touch with the Shia, who went after Saddam right after he pulled out of Kuwait. And we lost the opportunity to limit Saddam with respect to the use and deployment of many of his military forces and to squeeze him into a smaller area — a step that was complemented a few days after the end of the war by the French-inspired resolution protecting the Kurdish territories in the north. So in effect we would have pushed Iraq in terms of Saddam’s continuing control out of the Kurdish areas and out of most of the desert areas, including anything that went over toward the Jordanian borders. We would have control of that through the UN. My own feeling was that it was a huge missed opportunity, but one of the things that we do wonderfully is plan wars and execute them and one of the things we do traditionally terribly is to figure out on what basis to end them. This was, I think another remarkable example of that. FREEMAN: [Commander-in-Chief, United States Central Command General Norman] Schwarzkopf and I were so frustrated at this [lack of instructions] that, on the eve of the counterattack in the air, I sent in a cable saying that, not having heard anything about war objectives, and having discussed it with General Schwarzkopf, unless instructed otherwise, these are the objectives he is going to pursue, which were what I thought the lowest common denominator was…. We tried to get him instructions, he tried to get instructions, but Washington was unable to provide instructions, because they had no vision of what sort of peace they wanted to have follow the war. Of course, after the war, the absence of such a policy framework led to a fumbling and inadequate and greatly delayed response to both the Shia uprising in southern Iraq and the Kurdish uprising in the north. 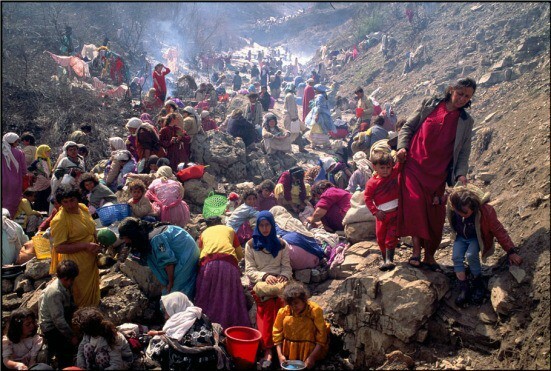 The Kurdish uprising in the north led eventually to a huge flow of refugees into Turkey…. This led to an international response in the form of a protected zone for Iraqi Kurds, a repatriation of the refugees, relief supplies, and reconstruction activities, which were thought of as temporary, but which, in 1996, five and a half years after the end of the fighting in the Gulf, continue[d] to be a semi-permanent feature of the Middle Eastern landscape. So the absence of war aims, the absence of a war termination strategy, in my view, is the reason why the war never really ended. There was no political negotiation, no request for one. In short, Saddam’s military disgrace was never translated into a political humiliation for him. Hence, he [was] still in power, being able to claim, with some justification, that he stood against the mightiest force the international community could organize and survived, which is itself a sort of political strength. The concern that I had in the region shifted immediately [after the signing of the armistice between Iraq and the coalition], rather, to two points, which were related: first, the absence of a policy with regard to the Shia rebellion in southern Iraq; and, second, the related issue of how to deal with prisoners of war and interned civilians from Iraq who were in the occupied area of southern Iraq. Now when I say “the absence of policy,” what I mean is that, since we had not defined the desired end state in Iraq, and since we had all assumed, including myself, erroneously, that Saddam would fall from power under the military licking that we had given him, we didn’t know what to do when rebellion broke out both in the north among the Kurds and in the south among the Shia. In the north, Turkish pressure to end the intolerable situation that was created by a massive flow of Kurdish refugees into southwestern Turkey forced the development of what became known as Provide Comfort, a relief and sanctuary operation for the Kurds. In the south of Iraq, the Shia rebellion, which had some assistance from Iran, was the subject of great confusion. Privately, the Saudis, very early on, began to press very hard, through me and directly in Washington, for a joint Saudi-American program of assistance to the Shia. The Saudis, despite their distaste for the Shia religiously, had come to the conclusion, correctly, I believe, that Iraqi Shia are Iraqi Arabs first and Shia second. They had certainly shown that in the conflict between Iraq and Iran. Nor did the Saudis wish to leave the field to the Iranians. And they saw support for the Shi`a rebellion as the key to dislodging Saddam Hussein from power. It was six months, however, between March 1991, when the rebellion began, and September 1991 before Washington could muster a reply to these requests. By that time, the Shia rebellion had been crushed. In the interim, in the absence of instructions, or perhaps carrying out instructions of which I was unaware, our military occupying southern Iraq, up through about June of 1991, routinely disarmed and interned any Shia who came across the line of control, thus draining the rebellion of its most effective military support. The United States destroyed vast arsenals of Iraqi weaponry, including weaponry taken from the Shia rebels. Some of that weaponry was removed quietly and provided to the mujahedeen in Afghanistan, but most of it was simply destroyed. So, in effect, whatever our intentions, from an objective point of view, we were allied with Saddam in suppressing the Shia rebellion, contrary to Saudi desires…. In any event, as the occupation of southern Iraq ended, the question immediately arose: What do we do with the Iraqi Shia civilians and fighters who had been interned? Now many of these people had come over voluntarily to the area of coalition occupation, and had served as interpreters or otherwise assisted the occupation forces, and were subject to the death penalty for treasonous behavior if they came back under Baghdad’s control. I, therefore, insisted very strongly, first with the Saudis and then with the United States, that these Iraqi rebels should be removed to a refugee camp in Saudi Arabia, and that the United States, having disarmed them and taken custody of them, should continue to exercise some degree of responsibility for their well-being…. Nevertheless, the Saudis agreed, in an important humanitarian gesture, and built a very, by normal Third-World standards, luxurious refugee camp, up in the deserts of northern Saudi Arabia, in which to intern both the POWs who had not been repatriated and didn’t wish to be and those refugees from the Shia population who were in the custody of the coalition. From many sources, but primarily from the foreign-intelligence side of the Saudi Arabian government, there were increasingly anxious, escalating requests for, first, American support for these Shia, in several forms, one of which, I believe, eventually was answered positively, although, as I said, six months late. And that was support in the form of a propaganda outlet for the Iraqi opposition to Saddam Hussein. As I say, these requests fell on deaf ears in Washington, perhaps because they were counterintuitive in terms of what Washington thought the Saudis might want, perhaps because they were in extremely restricted channels, naturally, as such requests always are, perhaps because the principal objective of Washington was to put the Gulf behind it as it moved toward the 1992 election. But, for whatever reason, the requests, which were serious requests, and which, as I say, were fairly constantly reiterated both to me and directly by very senior members of the royal family in Washington, were not answered. As they were not answered, a sort of tone of desperation crept into the requests. But, by mid-summer, it tapered off, as it was apparent that Saddam had successfully crushed the rebellion. The American focus at the time, to the extent there was one, was on the Kurds, where General [John] Shalikashvili, acting for the European Command, was operating a very successful repatriation of Kurds to northern Iraq and a resettlement program for those Kurds in a protected zone of northern Iraq. The continued condition of the Kurds is another subject. But no one was apparently prepared to comes to grips with this group of Shia in the south. The difficulty with the application of that thesis to the Shia rebellion was that the Shia were not attempting to secede from Iraq or establish a separate Shia state. They were focused on overthrowing Saddam and participating in national politics in Baghdad. So there was no inherent inconsistency between the two. Now it is true that if the Kurds, who are Sunni, are removed from the Iraqi equation, the Shia, who constitute about 60 percent of the Iraqi population, would exercise a dominant influence in Iraqi politics. But if the Saudis, who are the great skeptics about Shia Islam, were prepared to accept the possibility of greater Shia influence in Baghdad, it seemed to me it ill-behooved the United States to object. Nor did I believe that support for the Shia would necessarily have led in any way to the weakening of the Iraqi state. Now it is conceivable that the Shia might well have made common cause with the Kurds in demanding a more federal structure within Iraq. But I also fail to see why that is inherently objectionable. After all, the United States is a federal structure, and we find that it works well for us as a means of allowing a high measure of local autonomy and experimentation. I think the real answer is that serious consideration at a high level was simply not given to the issue. So the arguments that I’ve just stated were, in a sense, beside the point, because there was no willingness to pay attention to the issue. That, of course, in fact, may or may not have been the right decision. I simply note that we didn’t have a policy. And that the public appearance of Saudi opposition to the rebellion in southern Iraq was incorrect; that, in fact, they had quite a contrary view. And that we failed to give it even a response, still less, apparently, adequate consideration. Frankly, I was surprised by the willingness of the Saudis to put aside their religious doctrinal differences with Iraqi Shia and advocate support for them. Typically, in the history of the region, when a strong dynasty, the first al-Saud Dynasty, the second, the third, arises in Saudi Arabia, one of its first acts is to go smash the Shia shrines in southern Iraq. And there’s certainly no love lost between the Saudi Wahhabi adherents and their Shia fellow Arabs in Iraq. Nevertheless, whatever concern there might have been about the impact on Shia in Hofuf and the eastern province apparently was swept aside by considerations of realpolitik. WILSON: Saddam was prepared to kill as many Iraqis as necessary because as long as he survived, he was the embodiment of the state of Iraq; he was Iraq. He was more than willing to sacrifice literally tens of thousands of his fellow citizens in his really fruitless enterprise. As long as he survived, then the state of Iraq and the glory of Iraq survived in his somewhat twisted mind. We concluded that, while he didn’t physically fear or worry about dying, ultimately he saw himself embodied as the spirit of the state and of the Iraqi nation and as a consequence his survival was of some interest to him. I think it’s very clear that the administration at the end of the war assumed that all that was needed, as President Bush said, was for the Iraqis to take matters in their own hands. That led to the uprisings by the Shiite and by the Kurds which Saddam was able to put down because he had superior military assets and was able to fly his helicopters against them. I think very clearly that it was the assumption of everybody involved at the decision-making levels that Saddam would not survive this massive military defeat….Clearly they did not anticipate Saddam’s ability to hang on in the face of such a major military defeat and the subsequent humiliation of having sanctions imposed and having the no-fly zones, etc. MACK: By the last days of the war in 1991, many Iraqis assumed that the Iraqi military had suffered such a fearsome defeat that they were no longer willing or capable of enforcing the regime’s will internally. That turned out to be incorrect. The U.S. government knew that the Iraqi army was able to maintain internal control. Our question was whether the Iraqi units would remain loyal to the leadership in Baghdad. Ties between the Iraqi army and the Arab majority population were close. I won’t say that the Iraqi people as a whole were enthusiastic about the invasion of Kuwait, but many of them were. The fact is that neither the Shiite Iraqis in the south, some of whom made the initial uprising, nor the Kurds in the north had been actively dissenting to a significant degree before or even during the war. Most of the soldiers in the Iraqi army were Shiites, and we were not aware of significant internal dissidence at the popular level. The Iraqi government had organized many of the Kurds into various village militias that had effectively kept order and security in the north and enabled the Iraqi military to devote its attention to the southern and western battlegrounds. I don’t know what the opposition Kurdish Peshmerga freedom fighters were doing in late 1990 and January 1991, but they were not creating much trouble for the regime inside Iraq. 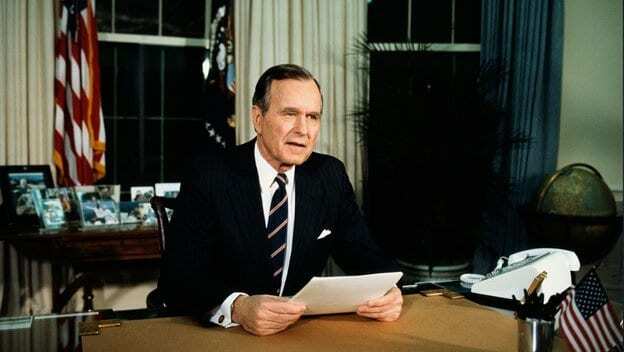 The fact that back in October 1990 George Bush had made a speech addressed to the Iraqi people suggesting that they might be better off with new leadership was not the spur to the uprisings of late February 1991. They weren’t responding to Bush’s speech. What they were responding to months later was the defeat of the Iraqi army and the feeling that now they would have a chance to exercise their own will. Long time Iraq-watchers in the U.S. government started from the premise that what held the Iraqi regime together at the center was to some extent a fear of centrifugal forces that might tear the country apart if they didn’t have a strong central government. This is a staple of Iraqi history that goes back to the ancient history of Mesopotamia. Certainly in early Islamic history we can observe that Iraq had a reputation of being fractious and that only a very strong central government in Baghdad could maintain unity. The Ottoman Empire had relied upon its alliance with the Sunni Arab tribes, and so did the British after World War I. 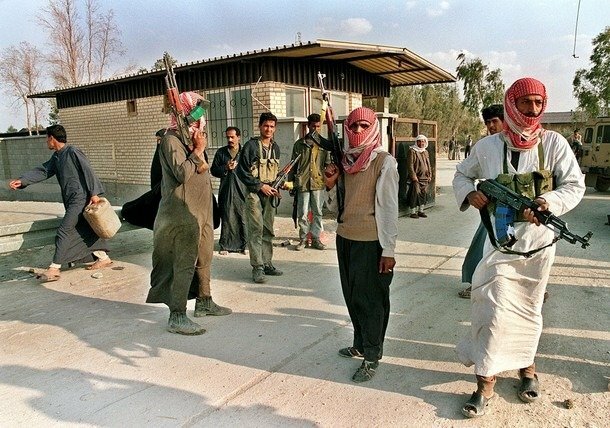 In Iraq’s independent history there was a tendency of the Sunni Arab core of the Iraqi regime rallying around one of their leaders if they felt threatened by insurrections from either Shiite Muslims in the south of the country or Kurds in the northeast of the country. That’s highly oversimplified. Indeed, the majority of the population in Baghdad had become Shiite, and there were a lot of Kurds in Baghdad too. But there was a sense that what held together the support base for the [Saddam’s] Baath regime was fear of the alternative. There was a fear both of Iranian influence dominating a Shiite religious movement in the southern part of the country and a fear of Kurdish separatist ambitions. Soon after the ground war ended, we began to get information about the Shiite insurrection in Basra and other southern cities. It seemed as if it was very spontaneous. At first we saw no evidence of Iranian involvement, for example. Most interesting to us were reports of Iraqi military units mutinying and joining the insurrection. That did not seem necessarily at odds with the idea of the Iraqi military turning against Saddam Hussein and marching north to Baghdad. What upset that calculation was the entry of Iranian influence, first on the part of some Iraqi émigré groups which had received Iranian refuge and support, including being armed by the Iranians. Encouraged by signs of spontaneous Shiite dissidence, some of these Iraqi émigré units crossed the border. Reportedly, they were followed by Iranian agents. There were also reports early in the uprising of retribution against the families of Baath party members in Basra, for example. These developments, in my view, caused the Iraqi military to rally around Saddam Hussein. After the Shiite uprising appeared to be having some success, the Kurdish insurrection began. They appeared to think that the Iraqi military was no longer able to maintain internal order. Once again, that seemed to start with spontaneous rebellions. This time, they were led to a great degree by the same Kurdish village militias that had remained loyal to the government throughout the war and for that matter throughout the Iraqi-Iran war in the previous decade. 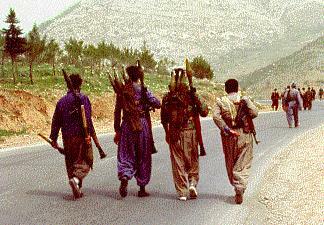 The organized Kurdish political parties in exile despised these Kurdish village militias, called jash in Kurdish. It was the central government armed jash that actually seemed to spark off the Kurdish uprising. Soon after, well known leaders of the Kurdish political parties, like Massoud Barzani of the Kurdistan Democratic Party and Jalal Talabani of the Patriotic Union of Kurdistan, appeared on the scene. 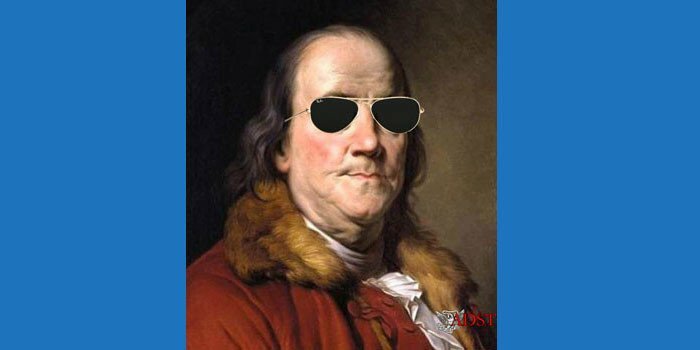 The feeling in the U.S. government was that they were struggling to get out in front of what had been a fairly spontaneous uprising that was not of their making. STAMMERMAN: There was the Shia uprising in the south of Iraq. The U.S. government assessment at the time, and I’d say this was anybody I knew, anything I read, was that Saddam did not have long, would not be long in power. That the collapse of his forces, with the few remaining forces he had would not be enough to preserve him against unrest in the south, the north, and even among his Tikriti clansmen whom he had led into disaster. The Shia uprising…took place not long after the end of the war. We were pulling out, so we were not involved. Our troops were getting out as quickly as we could. We pulled our troops out of Iraq as quickly as we could. We had no intention of occupying the place. As we pulled out, and this is what I’d heard from various Shia afterwards, as we pulled out, the Shia, lot of Shia soldiers and students decided that enough was enough, they now could take the south if they wanted. So they launched their rebellion, they took Basra, they took the Shia holy cities, and killed every Baath Party (Saddam’s political base) man they could find. There was a bloodbath against the Baath Party. There were very few Iraqi senior military commanders in the area, so the military wasn’t hurt that much, but the Baath Party apparatus was destroyed. They killed them all. But the Shia were not terribly well organized. Students and low ranking soldiers, there were no senior Shia commanders…. When the Republican Guard that had survived the American assault, the ones who we let escape, got themselves organized after the Shia had gone through their bloodletting… they came back in force, with armor, which the Shia didn’t have and killed everybody in sight. They killed all the fighters, of course, who they could find. I heard this from some of the Shia who got out. They went into the Shia holy places, the mosque of the Imams, and hanged people in the mosques, and then turned their attention to the Shia villages in the south, just north of the Saudi border. They were very careful to stay away from our forces and to stay away from Kuwait. And just drove straight through those villages, killing women, children, everybody. Those who could escape, fled….Those who could escape did, they went across the Saudi border. The only place they had to run. Our forces watched. They knew it was happening, and we watched. So we would get reports back of what was happening, but that’s it. The refugees fled across the Saudi border by the thousands. The Saudis put up a camp, due north of Riyadh, up by the border, and kept them there, since they were Shia, they were not going to let them into Saudi Arabia proper. I’ve heard that we leaned on the Saudis to allow the Shia to cross the border. If it were up to the Saudis, they would have left them on the other side of the border, many Saudis would have anyway. So, we watched it happen, and there was TV of course, we heard what was happening, saw the reports, and it was over fairly soon….Essentially, for the Shia rebellion, we watched it happen.